Way back in 2010, immediately after Obamacare was rammed down our throats, I put together four guiding principles for a counter-offensive. 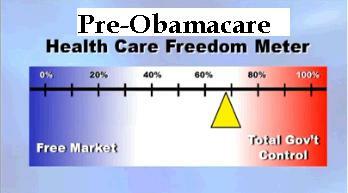 One of my goals was to help people understand that the problem was far greater than Obamacare. Indeed, the so-called Affordable Care Act was merely another step on a long (and very bad) journey to healthcare statism. The way to think of Obamacare is that we are shifting from a healthcare system 68 percent controlled/directed by government to one that (when all the bad policies are phased in) is 79 percent controlled/directed by government. Those numbers are just vague estimates, to be sure, but they underscore why Obamacare is just a continuation of a terrible trend, not a profound paradigm shift. Two years ago, I elaborated on this thesis and even put together a couple of charts to emphasize the point. Obamacare was enacted in 2010, and it was perceived to be a paradigm-shifting change in the healthcare system, even though it was just another layer of bad policy on top of lots of other bad policy. Immediately after the legislation was approved, I offered a rough estimate that we went from a system that was 68 percent dictated by government to one that was 79 percent dictated by government. …all of the same problems still exist, but now they’re exacerbated by the mistakes in Obamacare. My numbers were just vague approximations, of course, but I think the basic premise was spot on. And my theory is still accurate. But you don’t have to believe me. Writing for the Washington Examiner, Philip Klein makes the critical point that repealing Obamacare wouldn’t result in a free-market system. Instead, we’d be stuck with the pre-Obamacare system that was decrepit because of already-existing programs, mandates, regulations, and other forms of intervention. …repeal is not enough. Even if simple repeal were politically obtainable, Americans would still be left with a broken healthcare system. Government regulations would still be stifling competition and individual choice and government healthcare programs would still be driving the nation’s unsustainable long-term debt problem. If Republicans achieved repeal without agreeing on a way to reform healthcare along free market lines, it’s inevitable that Democrats would eventually lead another overhaul of the system that would grant even more power to the federal government. Before Obamacare, we had a system that didn’t work very well because of government. 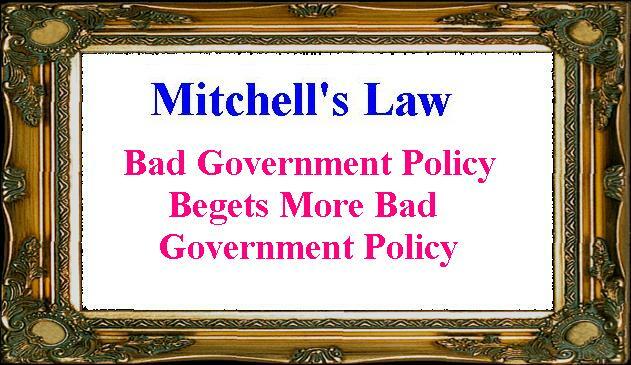 But in a horrifying example of Mitchell’s Law, many people decided that more government was the solution to the problems already caused by government. Hence, we got so mis-named Affordable Care Act. But if Obamacare is repealed, we’ll simply be back in the same unstable situation. And Philip is right that the statists will then simply argued for a different type of government expansion. Probably single payer, notwithstanding all the horror stories from places such as the United Kingdom. Some may argue at this point that it doesn’t really matter because Obama is in the White House with a veto pen, so critics have a couple of years to figure out their next step. Maybe, but it’s also possible that the Supreme Court will (for a change of pace) make the right ruling on a key Obamacare case later this year. And this would probably force policy makers to re-open the law. …a Supreme Court decision expected by late June could invalidate Obamacare subsidies for millions of Americans. If Republicans don’t have an alternative ready, congressional leaders will be under tremendous pressure to pass a simple “fix” that would allow the subsidies to continue to flow, thus further entrenching Obamacare before a Republican president theoretically is able to act in 2017. For these reasons and many others it’s important for Republicans to unite around an alternative to Obamacare. Philip (who has an entire book on this issue) then proceeds to categorize Obamacare critics as being in three different camps on the issue of how to proceed. The first approach comes from those who believe that fully repealing Obamacare is probably unrealistic, but who still see an opening to reform the overall healthcare system in a more market-oriented direction. I call this the Reform School. The second approach comes from a crowd that believes full repeal is a necessity, but can only occur if opponents of the law create a market-friendly alternative with enough financial assistance to make health insurance widely available to those Americans who want to purchase it. I call this the Replace School. And finally, there is a third approach, which advocates repealing the law, returning to pre-Obamacare levels of taxes and spending, and then using that clean slate as the basis to overhaul the system in a free market manner to bring down costs. I call this the Restart School. Since I focus on fiscal policy issues rather than healthcare, I don’t know if there are substantive – or merely strategic – differences among these three groups. But I will say (assuming you actually want to solve the problem) that at some point you have to deal with the government programs and interventions that have given us a third-party payer crisis. So I will reiterate what I wrote back in 2010 as part of my proposed counter-offensive. And if you want to examine some of the component issues of healthcare reform, we have videos on Medicaid, Medicare, and tax reform. The Democrats/Progressives have a vision. It is blurry and misguided, but it is a vision of central control, doing the right thing, and somehow working out a solution after they have total power. Why go into the details before you have the power to implement each and every detail with the appropriate penalty? The Republicans have a vision of weakening the plans of the Dems/Progs while diverting funding to their special interests. This is a no-win strategy which insuures maximum participation with minimum boat rocking. Both parties see the public in majority as mindless, self-interested, and grasping. They may be right, in which case there is no hope. A mindless majority is going to sell themselves down the river for a free ice cream cone. If they are wrong, a slim hope, then the Republicans are not going to change anything without their own strong vision. Even I don’t feel like voting for people not smart enough to propose their own solution in detail. It is tiring and useless to support people who can only weakly oppose the bad plans of the Democrats. The Republicans are correct to oppose those plans, but are correct in an ineffective and repulsive way. I favor H.L. Mencken’s observation: Democracy is the theory that the common people know what they want, and deserve to get it good and hard. The Republicans are not going to win the public with their strategy of hanging back, not offending anyone, and winning only because the Dems screw up. Even if they win, they have built no support for a better system. So, may the Democrats win, and may the public get what they think they want, good and hard. 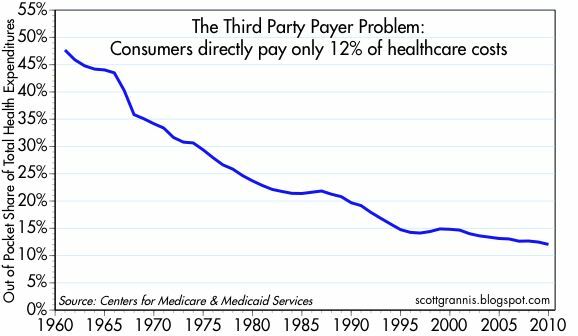 Third party payer is horrible, when government is the third party; but insurance companies have been corrupted by the presence of Medicare, Medicaid and Obamacare subsidies, so they also make lousy third parties. 1. Healthcare costs are lumpy and unpredictable. A family can coast along and get hit with a one-time or chronic healthcare incident. To combat that, there must be access to pooled resources, to smooth one-time costs or to cap family expenditures at a reasonable level. 2. Many of the costs in #1 can be avoided by following a healthy, low risk lifestyle. Insurance contributes to moral hazard, so a significant portion of costs of high risk activities and lifestyle must fall back on the individual to decrease moral hazard. 3. Some form of universal healthcare is optimal, since a system with “free riders” will fall apart. Government can play a part here by providing funds for all citizens to pay for minimal healthcare. Support that can be lost by earning additional income creates dis-incentives, so all should receive funds. This can be paid for by dollar-for-dollar reductions in Medicare and Medicaid support and by the elimination of the healthcare tax deduction. 4. Support for those with “pre-existing conditions” must continue. Once we have achieved universal healthcare, there will be no new additions, so need for this support will decline over time. 5. With patients paying their own healthcare costs, we must deal with the knowledge mismatch as to “best practice” and cost. Patients need unbiased resources for information and the ability to receive best pricing.